Please submit corrections/submissions in the Dually Discussion forum. 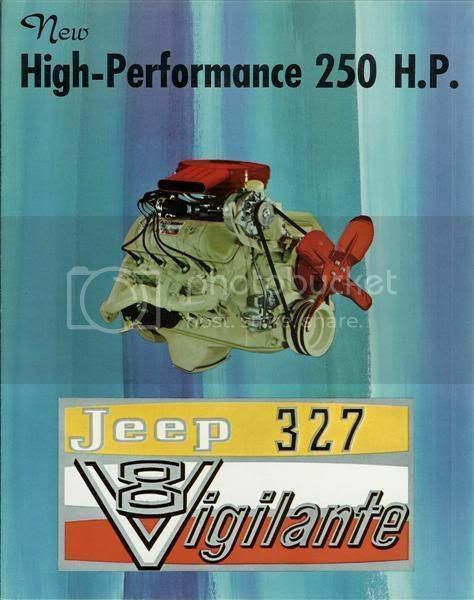 The parts manual shows a 1962-1964 fifth digit designator in the VIN as "H" which is for the dual wheel, 230, 4 speed, 9000 GVW (refering to the FC-170 DRW as all Gladiator DRW trucks were 8,000 or 8,600 GVW up to ~1970); the "G" shown for those years is 230 3 speed 8000 GVW, “D” = 8600 w/ 4 speed and dual wheels. 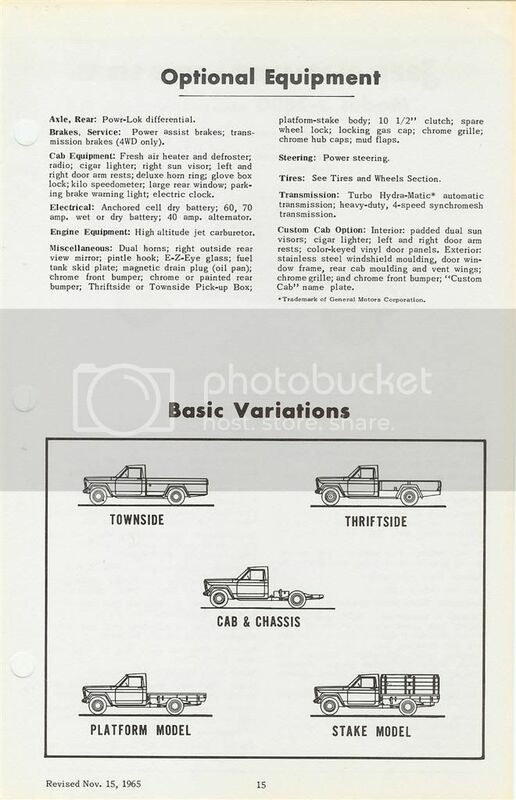 Early Kaiser (1962-'65) DRW trucks were "D" codes - 2306D, 2406D, 3306D and 3406D. Total production recorded up to Feb 1967 is 967 DRW J Trucks. Gaps in those records are fairly large missing possibly 40-50 trucks in early 1965, and everything from March 1967 to whenever production ceased ~1970. Apparently (referencing the VIN tag of the 1970 Aussie DRW flatbed) at least 205 were produced from the point the VIN series changed to begin with J which I believe was 1970. After 1965 the Z Code VIN series begining in 1,2 or 5 are related to the engine used, 1 and 5 for V8 and 2 for 6cyl. From 1965 on: Series 50001 thru 199999 = 8-327 and Series 200001 thru 299999 = 6-232. There appears to possibly have been nine Comanche DRW trucks either built by the factory or as dealer conversions. One is listed in the registry below and will be investigated further. Please contact me if you have any information regarding Comanche DRW trucks. Up to 1970 wheelbase options were 120” and 126” (with variations for the chassis mount camper up to 165”), from 1970 on the wheelbase options were 120” and 132”. In 1970, the Gladiators changed from the “Rhino” grill (with the exception of those trucks exported to Australia apparently) to the same style grill as the Wagoneer, “Razor” grill, it's first styling change since its introduction. It was badged AMC on the grill instead of Jeep. The 3000 series was dropped in 1971. Rear brakes are 13x2.5" and the fronts are 12x2". From the brochures I've read the parking brake was mounted on the rear output of the D20 transfer case. That assembly is still available through Herm. View schematics at: Brake Assembly Schematics. Optional parking brakes were hydraulic systems such as Mico. M715/Dodge W300 rear D70 rear disc brake conversion kits are available from Helitool at: UglyDuckling.com It has yet to be verified if this disc brake modification will work with the dually rims. Also note that the FC 170 DRW/Gladiator DRW D70 has a different hub/drum assembly so it needs to be verified if the this conversion would work with the this specific D70 or if M715 hubs would need to be used. Looking at respective manuals/schematics... the dually D70 has drums that mount on the backside of the hub with the studs going through the hub flange complicating dissembly for brake repairs. On the M715 the drum mounts over the hub and the studs go through the hub flange and then the brake drums. On the M715 it would have been designed this way to be able to remove the brake drums separately from the hub/axle shaft for quick tear down. On the civvy DRW you had to take it all apart to get the drum off. The D70 M715 spindles have the almost exactly the same dimensions (from the measurements I have) as the DRW D70 so you could potentially upgrade to the M715 hub/drum assembly. - The diameter of the inner bearing diameter surface is 2.250" (the Gladiator D70 is 2.22). - The diameter of the seal surface is 2.750" (the Gladiator D70 is 2.68). There are kits out there for converting the old closed knuckle D44 front axle to disc brake using sourced parts and I think the 6 bolt DRW adaptors would probably bolt up to the 5 bolt hubs in the same fashion after the conversion. Here's a Front axle kit and here's a Write up on the closed knuckle conversion. Any D25/27 conversion article should be the same process. 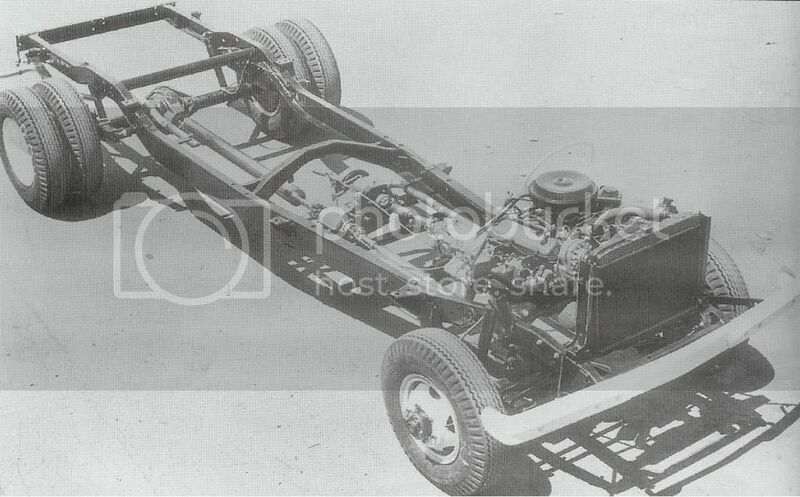 * For Kaiser era rigs the axles used were the Full Float Dana 70 rear and closed knuckle D44 front (with dually adaptors). * Ratio was 4.88:1, 5.89 was standard on 230ci equipped trucks and optional for other trucks (excluding the V8 in combination with the Powr-Loc limited slip). * They had self adjusting rear brakes. * D70 wheel mount surface (WMS) is 72.5" (axles are similar to the M715, with the exception that the Gladiator DRW had drums mounted behind the hub that required the axle shaft and hub to be removed to remove the drum, while the M715 D70 had drums held in place by three screws and could be removed separate from the hub and axle shaft. Additionally, the M715 uses a .50" pinion offset and the FC 170 or Gladiator DRW has a pinion offset of 1.120" requiring at least a different pinion and ring gear. I am researching if the same carrier is used and hope to obtain Dana part numbers for the pinion and ring gear). The FC-170 SRW D70 axles have a WMS of 66" due to a narrower frame, and I've been told by a FC 170 DRW owner that the DRW WMS = 76"s.
* The D70 had 1.5" 23 spline shafts. * Powr-Lok rear limited slip was available. * D44 WMS is 72.5". * The closed knuckle D44 had coarse 19 spline count on inner and outer 1.31" shafts and differed from the std D44 with the use of DRW adaptors extending the WMS to fit the more offset dually rims. 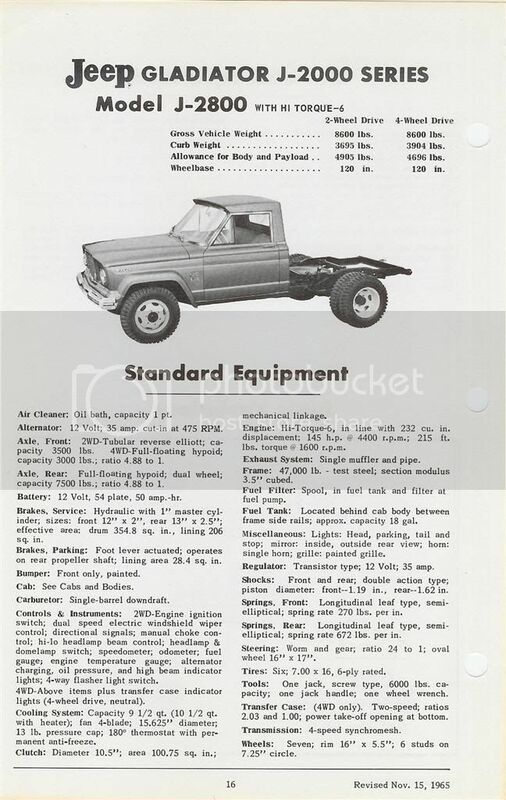 * For AMC era rigs after '73 open knuckle Dana 44 front axles were used and it appears that the only rear axles used were Dana 60. Up to '73 the D44 were closed knuckle and the rear axles were D70. However, I have only located one 1970 J3000 DRW flatbed and one 1978 J20 DRW wrecker so I have limited AMC era info to go on so far. * The M715 could be converted to duals without changes to the axle (other then possibly the length of the rear lug bolts and type of rim used). M715 wheels have a backspacing of 5.5" and width is 6.5" -vs- the 7.25" back spacing and 5.5" width of the Gladiator dually rim. According to one M715 owner: "Some of the m715 wheels are made to be run in the dual setup. The offset is the same as stock wheels. Just reverse mount outside wheel. Three of the lug nut holes are beveled opposite of the other three holes, this locks em together." * The TH400 was recommended for the chassis mount camper trucks and was used in a 1970 DRW Australian truck pictured in the registry. * M715 wheels have a backspacing of 5.5" and width is 6.5". Modern rims are produced by Stockton Wheel. The Power Wagon II wheel allows for custom dimensions on the same bolt pattern and for running tubeless tires. 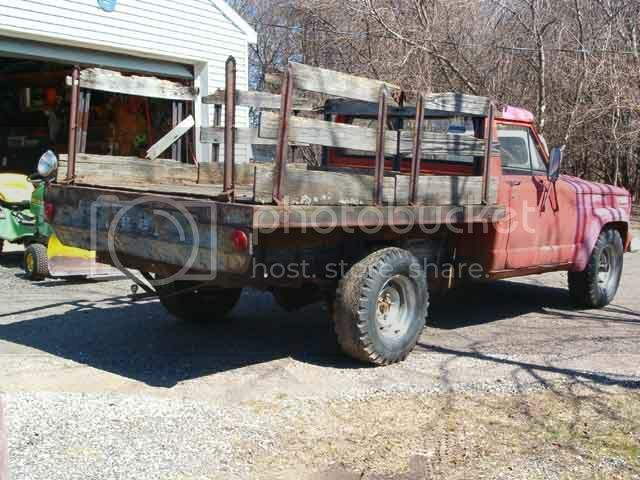 The owner of this 1967 SRW Stake Bed Gladiator is working with me to reverse engineer the factory stake bed. The hardware and stakes are currently being sourced, if you have sources you have come across please share them with us. 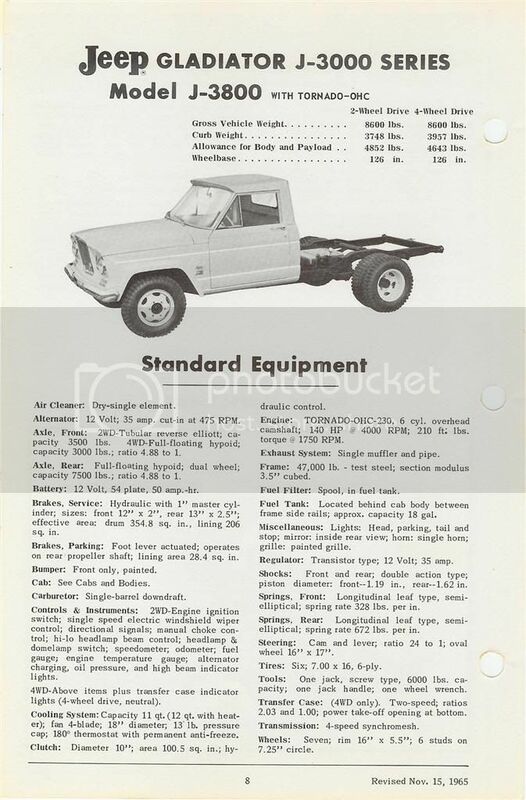 One very interesting variation on the dually is an old photo showing a dually chassis with the addition of a closed knuckle D60 front axle, a Buick 350, what looks like a TH400 and a divorced NP200 transfer case. Comparison of the distance between the inner rear dual and the frame on this chassis to the same clearance of a regular DRW Gladiator (check the J3000 Wrecker, NC pics) it appears that a M715 D60 axle was used up front. There are rumors that 455 trucks were built, but are they just rumors? The valve covers will be held down with 5 bolts and will have creasing as shown in the picture below of Buick 400-430-455 valve covers. If anyone has info on such a rig that was produced or has more pics please contact me. Anyone having any info on various applications... please share what you know. Please note that this is a project in work and info will be updated as it is documented. I have entered most of the Jeep Duallys that I have been able to track down to date (although many have outstanding vin information). There are several others I know about, but I'm waiting to obtain enough info and pictures to add to the registry. I will continue to add to the list as time and information permits, please check back for updates.